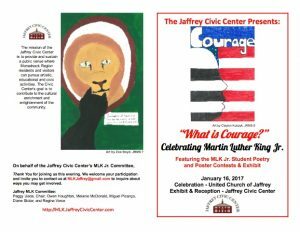 On January 16th, The Jaffrey Civic Center sponsored an event entitled “What is Courage? 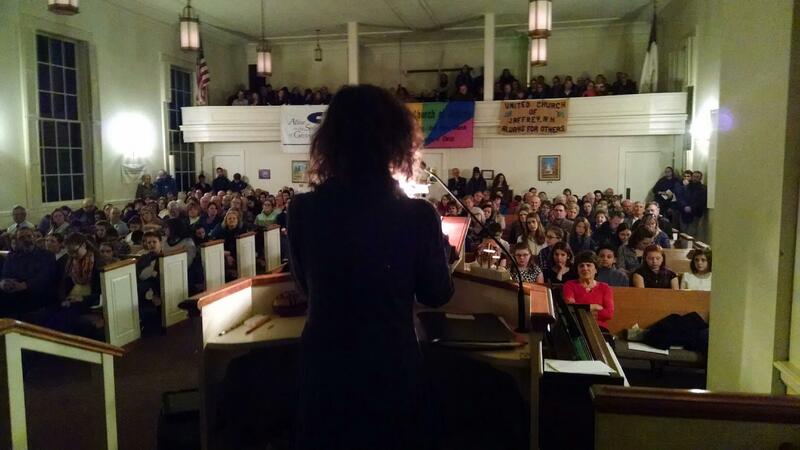 Celebrating Martin Luther King Jr. We, at the United Church of Jaffrey, were proud to provide the venue for this event, which included speakers, choral singing, and art and poetry contests. 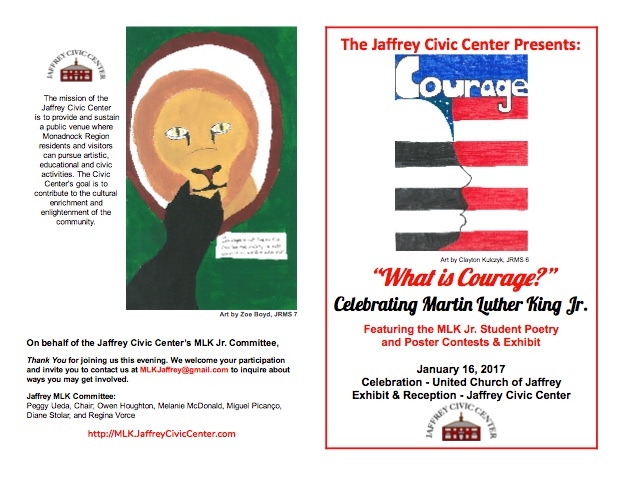 The young artists in the local schools who contributed work celebrating Dr. King and the Civil Rights Movement, had their art work exhibited at the Civic Center, and the winning posters graced the cover and back cover of the evenings program (seen here on the right). 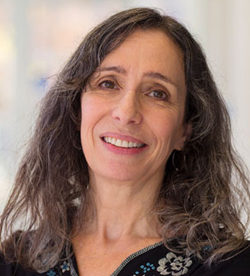 Young poets submitted written work that was judged by the New Hampshire Poet Laureate, Alice Fogel. Winners read their poems at the celebration. Alice Fogel, the New Hampshire Poet Laureate, was the evening’s keynote speaker. She offered a inspiring and thoughtful speech entitled “The Courage to be Unsure” (the text of which can be found below) to a packed house. Other speakers included, Owen Houghton, Reverend Mark Koyama, Douglas Williams, and Diane Stolar. Choral offerings were provided by the Jaffrey Grade School Chorus, the Rindge Memorial School Chorus. It was a lovely evening filled with memories offered by those who lived during Dr. King’s era, and profound hope offered by young people inspired by his vision. Having Alice Fogel with us made everything all the more meaningful. The United Church of Jaffrey was proud to be a part of the program. Uh-oh. He’d be right, of course. So I began asking myself more seriously what place the courage to be unsure has in our lives, and whether it is a necessity or a luxury to seek and practice it. The first thing that came to mind then, which I thought many of you younger people might appreciate since it was written recently by a 17-year-old, was the college application essay of my niece, Camille Fogel. In her essay, she talks about self-doubt—that kind of unsureness—and how she tried to convince herself to fake bravery, as if that “could be awarded with a medal,” and help her develop “strength of character.” She says, “Everywhere, people spewed their personal sentiments and ideologies with the authority that I lacked….I was awed by their self-assured rhetoric that pressured me to let go of doubt and see what they saw: a one-dimensional, clear-cut world where nothing overlaps.” For these people, it seemed, nothing was in the gray area that she saw everywhere. It was through art that Camille learned to understand and believe in the value of a different kind of bravery, one that might not always be all that impressive to show off. If we trust in the artistic process and its constant choices and changes, she realized, we find the beauty and power in what is difficult, unclear, even beyond our control. Working within a realm of “uncertainty, ambiguity, and grayness,” as she puts it, isn’t a weakness; it’s “an advantage.” We can see the gray areas, stand right there in them, sway in the unsteady balance they might put us in, and at the same time feel strong, feel good about ourselves for accepting the validity of this threshold on the way to making something out of those challenges. While unsureness may be uncomfortable, it’s a discomfort we can learn to embrace as an important condition of creative problem-solving, self-awareness, and growth—as long as we let go of self-judgment about it. —Because it also helps us let go of judgment of others. It opens us up to understanding there’s more than one way things can work, more than one point of view. It opens us to being interested in how difference expands our own worldview, so that eventually we come even to prefer being unsure of the sovereignty of the view from our hilltop as compared to someone else’s from the next one over. We want to hike over to that hill too. Here’s another way art helps us develop tolerance for and interest in the unknown. In the last chapter of my book, Strange Terrain, I joke about how developing the ability (through reading poetry, of course) to believe in the positive challenges of difference and unknowing—even embracing them—can improve your life, lead to less conflict in your intimate personal relationships, and maybe even lower your blood pressure. But I’m serious. Strange Terrain is about how to appreciate poetry even if you don’t “get” it—by which I basically mean: appreciate the value and even necessity of being unsure. The book leads you through a series of ways you can enter into a poem, or let it enter you, without analysis or explanation. Words, images, sounds, shape—all things that are right there on the page and in your mind. But the last chapter, called “Unknowing,” acknowledges that no matter how much you know about what goes into the making of a poem, and no matter how many times you read poems and feel them and contemplate them, you are never going to be 100% sure what the next poem you read means. Even as you read a poem, and experience familiar emotion, shared humanity, a visceral understanding of the beauty and fragility of our lives here—the loves, the losses, the complexities and paradoxically possible impossibilities—even so, when you read poems you will be mystified. Right? —Because isn’t it true that much of what we recognize to be closest to the heart of our lives IS mysterious? Who am I? What are we doing here? What are we made of—beyond the mostly-explainable body—this consciousness, this spirit we feel to be us, to be real? What is God? Where does the impulse for art or for wonder come from? Why do we grieve? Why do we fall in love with who we fall in love with, and not someone else? Wind-blown leaves, the silence of a snowfall in the woods, the reflection of trees in water, a shell delivered whole on the beach, the eyes of a deer looking right into ours—why are these so moving to us? What possible evolutionary purpose does “being moved” even serve? But in this unstable world of ours, can we afford to linger in the forests of the unsure? Will it waste precious time? Time in which we need to be productive, to foster change, to make sense, make others see sense? The courage to be unsure is related to the courage to do nothing. Doesn’t doing nothing get us into trouble, or at least not get us out of it? I think what gets us into trouble is pain. And unexamined pain leads directly to increased fear, which makes us do dangerous things without thinking, or thinking we know more than we do. It allows for no tolerance for just about anything. No tolerance for being unsure, that’s for sure! And that means more trouble. When we don’t have the courage to be unsure, we don’t act from a place of rightness, from a place of calm and compassion; we react. We all know by now that if we don’t look at what’s going on in and around us, and yet we act as if with conviction, the force will not be with us. What happens if we don’t stop to interrogate reality is that we live in the opposite of freedom—we live in fear, and in fear of fear. If we don’t stop and face causes and consequences, pain and its attendant fear dig down deep like a well, and they explode in every direction, fracking the ground we stand on. It takes a lot of courage to be unsure enough to say, wait, stop, this isn’t right, this isn’t working, this has to change. Self examination means being unsure. Listening completely openly, open to learning something from or about someone else, means being unsure. Separating our valid emotions from our possible options for action means being unsure. Seeing that we are all imperfect and all improvable—especially ourselves—means being unsure. Accepting that we need to work with each other, bridging differences for the sake of our same shared human rights means being unsure. These mediating approaches to problem-solving are not luxuries; they’re necessities, personally and politically. –For our own sakes and for those around us, in increasing circles—our families and friends, our neighbors and communities, our country, our world. Those people my niece Camille referred to, the ones so sure of themselves, never considered the gray areas, never asked that big question: What if…? What if what I do is based on what I think I know, and it turns out that what I think I know isn’t true? The processes of creating, questioning, understanding, revising, and re-understanding that the arts teach us are processes of unsureness, of the what if that is in some ways the basis of the higher levels of morality. For example, we can look at a painting or a dance and—influenced by the colors and forms and motion someone else chose to embody a mood–feel our own mood shift. We can read a tale written in another century, in another land, in another language, and laugh or cry over experiences we’ve never had, those of a person we never met, because we have our own experiences that trigger the same emotions. We can write our own poem or story, and then rewrite it because we realize that changing it will better convey something we didn’t even know we needed to say, that was never said just this way before. We are all connected. Art tells us we are wired for survival no more by means of rigid competition than by means of flexible empathy. That day when I started thinking about this talk, I was sure I knew where that path in the woods was going to come out: on a snowmobile trail that links into the end of a road on a ridge I know well. But the trail seemed to have been created by someone with a strange sense of humor. It was narrow and twisted in inexplicable ways, crossing and recrossing streams and stone walls, ducking under low tree limbs, through brush, over rocks. I was twisted around too, but still I knew where it was going. Eventually, I came into a large clearing I hadn’t expected, and as I walked out into it, I realized that I wasn’t anywhere near the snowmobile trail, or anywhere else I was so sure I’d end up at. What did I know? I was completely lost, and, as it turned out, I was damn lucky to be right back on the same hill where I’d started, not far from home. Uncertainty is not the opposite of conviction but its true companion. Contemplation can lead to more fair action, stillness can lead to more effective movement. We need to take the time and care to observe the gray areas, to put ourselves in others’ shoes—even to stand still and look around in our own. We need to question what we’ve been told, what we didn’t yet think to question, we need to doubt, to consider what words and actions really signify. We need to be brave enough to wait and wonder and seek out where the hurt is, so that it can be healed instead of ignored and increased. And THEN, only then, with conviction not ideological but humanitarian, we can take action from the heart to decrease pain, decrease fear, decrease need—to feed, to comfort, to love, to empower. To free.